10 Things You Never Knew About Tequila | Valet. 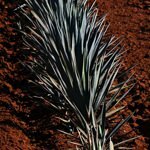 Lessons learned from a trip to the agave highlands of Mexico. When I was invited by Tequila Cazadores to come to witness their operations in the heart of Tequila country, I pretty much agreed instantly. 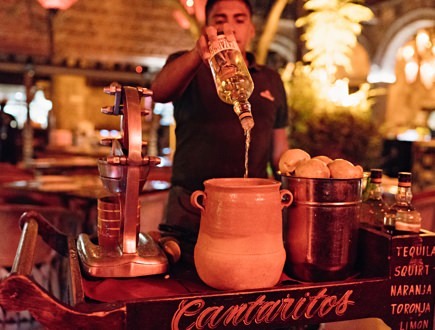 Nestled into the picturesque highlands of Jalisco, Mexico (about a half hour drive from the bustling streets of Guadalajara), they grow, distill and bottle their small-batch tequila using the original family recipe from 1922. And I wanted to see how it all comes together. After all, I pride myself on being a lover of tequila, but what did I really know about my beloved spirit? Here's what I learned, after trying my hand at harvesting, tasting raw (and roasted) agave juice and blending my own batch of barrel-aged tequila. Tequila has a sacred and mystical origin story. 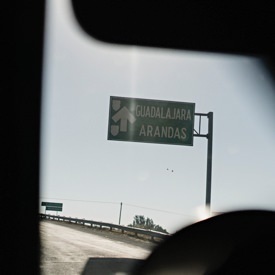 On our drive from Guadalajara up to the highlands of Arandas, our local guide, Tania Oseguera, explained the history and legend of tequila's heritage. The agave plant was a sacred crop for the pre-Hispanic Mexican people. They stripped the leaves to make thatch roofs, they made paper and clothing from the plant's fibers and used the plant's needles for sewing. The only thing they didn't use was the thick, round core. Those they typically disagreed, until a bolt of lightening struck a pile of discarded cores, essentially cooking them. The cooked agave smelled sweet, like pumpkin pie, and the natives began eating it and drinking the juice. Once the juice fermented, it took on the alcoholic properties and some might say became even more sacred. Eventually, the Spanish would come and introduce the concept of distilling. Tequila is a matter of great importance in Mexico, closely linked to the heritage and pride of the country. In order to preserve this legacy, the production of tequila is regulated by the Consejo Regulador del Tequila. 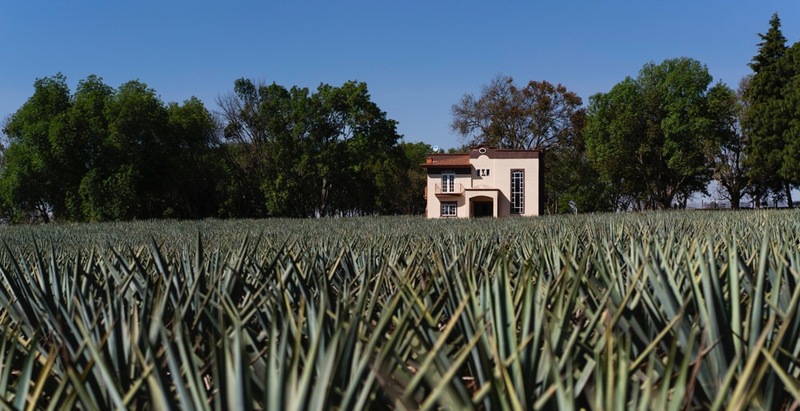 They uphold strict standards for production, such as ensuring that all tequila is only made from blue agave, distilled at least twice and bottled in Mexico. If you're ever invited to a lucha libre show, go. Just know that you shouldn't sit in the first three rows (where guys are often thrown into the crowd). Around the Arena Coliseo de Guadalajara, middle fingers fly and slurs are shouted from the stands, but it's all in good fun. In the ring, the masked wrestlers fight and fly through the air, cracking punches and spitting out teeth (hopefully fake?) much to the delight of crowd. It's a rowdy, raucous locals-only kind of event that never disappoints. 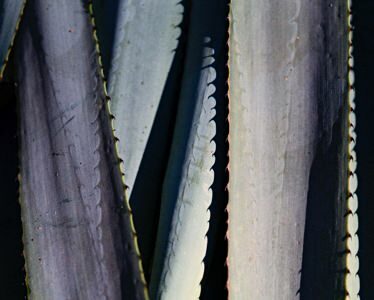 The agave plant is the main sugar source that ferments to create the alcohol in tequila. And agave, like grapes, can be sensitive to the conditions of where it's grown—a phenomenon known as terroir in the world of wine. Different growing regions produce different flavor profiles. For example, the highlands of Jalisco, where Cazadores grows their agave, tends to have a slightly cooler climate, which stresses the plants. 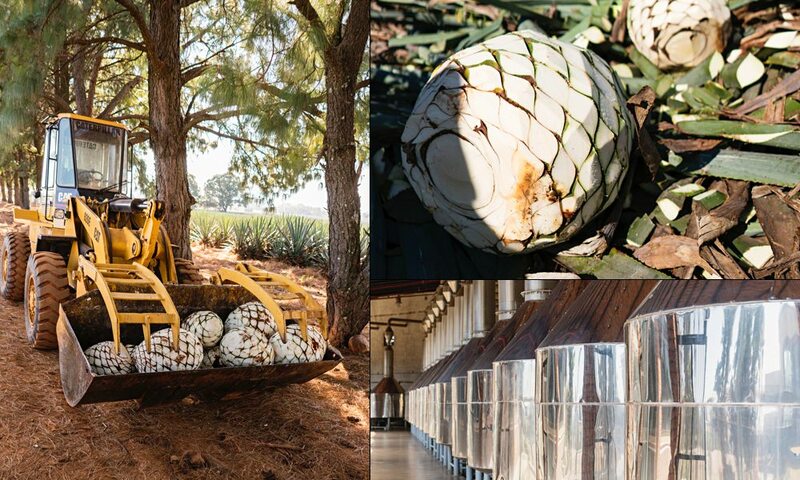 This creates more sugars within the agave and yields a sweeter, more fruit forward flavor in the final tequila. The lowlands are drier and a bit warmer, which yields more herbal flavors with a bit more bite. Tequila is one of the world's most labor intensive spirits to make. An agave plant must grow for six to ten years before it's ready to be harvested. Then the "piña," or root bulb of the agave cactus, is shorn of its spiky leaves and cooked. The roasted piñas are then juiced and the juice is fermented before being distilled. The tequilas are finished by aging in wooden barrels; the amount of time aging changes what type of tequila is finally produced. 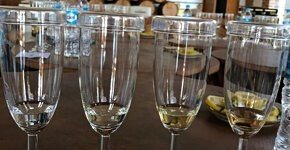 Oseguera, our guide, joked that even "a bottle of unaged blanco tequila takes, at the very least, six years to produce." 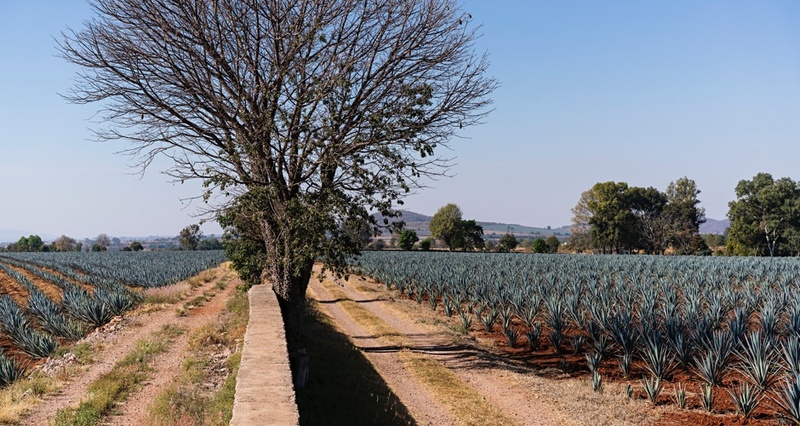 The icy blue sea of agave plants, contrasting against the iron-rich red soil of the Jalisco landscape is a sight to see. Even more striking is the process of harvesting. 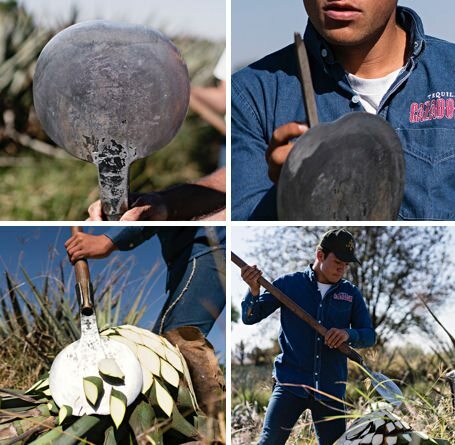 The agave are harvested by jimadores, farmers wielding a razor-sharp coa—the specialty tool that's something like a machete mixed with a shovel. It's used to both uproot the plant and then shave off the long, pointed leaves to create the round, pineapple-shaped core (which can easily weigh well over 100 pounds each). to produce a good tequila. The small batch approach takes more time, but always yields a better final product. Slow-roasting the agave is one thing, but what about playing classical music throughout the fermentation process? 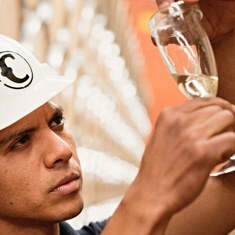 Oseguera explained that Cazadores' master distiller is a believer in the Mozart effect on all living things, so the music is used to relax the yeast during fermentation. There are three main varieties of tequila. Un-aged and bottled immediately after distillation, or aged for less than two months in stainless steel or oak barrels. Minerals, salt and herb, citrus oil. A medium-bodied tequila that's been aged at least two months, but less than a year in oak barrels. Vanilla, caramel and dried fruits with spice. A full-bodied tequila that's been aged at least one year, but less than three years in small oak barrels. Smoke, coffee beans and dark chocolate. Gold tequila (A mixture of blanco and reposado tequilas) and Extra Añejo (aged at least three years in smaller oak barrels). Serious tequila drinkers don't do shots. Instead, they sip tequila from a special tequila glass or snifter. That way, the spirit's complex flavors and aromas can be properly experienced and enjoyed. Our guide gave us an expert lesson in tasting tequila. How to identify the flavors and the importance of breathing during a tasting. She said the proper way to taste the spirit is this: let the tequila coat the top of your tongue, take a breath in through your nose, swallow and then exhale. Another way we enjoyed sipping an aged tequila? Chased with an orange slice dipped in cinnamon, which brought out all the warm spiced flavors of the tequila. Don't mess with anything other than 100% blue agave. Anything less is known as "mixto," but you won't see that term used on the label. Mixto tequila is made from 51% agave and 49% "other stuff," usually sugarcane plus artificial flavorings and caramel coloring. And because it's usually less distilled and has more impurities, it can lead to stronger hangovers. An unopened bottle can last years. But after opening a bottle of tequila, you should drink it within two to three months. Leaving it open any longer puts it at risk of oxidization and evaporation, which lowers the quality of the tequila and diminishes the flavor profile. Like a beefed up Paloma, this refreshing sparkling cocktail was made up for our group in a big batch. But here's how you can make one for yourself. Fill a glass with ice, then add the tequila and juices. Top with grapefruit soda. Margaritas? Of course. But don't be afraid of trying a few other easy-to-whip-up cocktails. Forget about the shot glass. Or the worm. This Mexican spirit is nuanced and made for sipping.